Inked Office Solutions is where technology meets service. Now offering online ordering, we make it simple to order at INKEDOS.COM Our website features an advanced online system that simplifies the ordering process - it’s easy to start an order, save it, add to it and build an order at your convenience. Your Inked Office Solutions dedicated Account Manager will proactively help set-up your favorites, adding them only a click away - to speed up the ordering process. Many of our customers prefer to have multiple user access to INKEDOS.COM which allows orders to be placed for multiple departments and cost centers. Creating your NEW Account: Getting set up to order online is quick and simple! 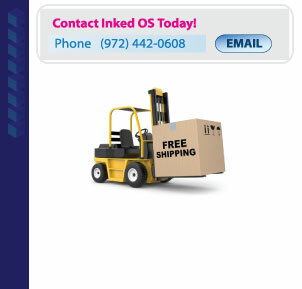 Just call Inked Office Solutions to get started with our helpful customer support team and will set up your account with secure access to the online ordering system at INKEDOS.COM. Online ordering at INKEDOS.COM will save you time and money - it is that simple!